I've been waiting to share this tutorial for a while now, because I was hoping to have a perfect end product for the big reveal. But I'm just too darn excited to wait any longer. And, look! I even made a fancy-schmancy Pinterest-friendly graphic for it! I've wanted to try this for ages, and I have to say, it's pretty exciting when a harebrained craft idea actually works. As you can (hopefully) see, the cross-stitched heart really does appear to be floating in mid-air inside the resin. There's no fabric at all here, and no visible means of support for the embroidery floss. - Keep the back tidy! No stretching across other stitches. You're probably wondering how I knew where the holes should go while stitching on the plastic sheet. That's the sticking point, I'm afraid; you just have to wing it. I think I did alright on the heart, but for the Space Invader I got a little off on the right side; you can see his arm is a lot lower. For the heart I cut the plastic in the shape of the mold I'd be using, and for the Invader I trimmed it as close to the threads as I dared. 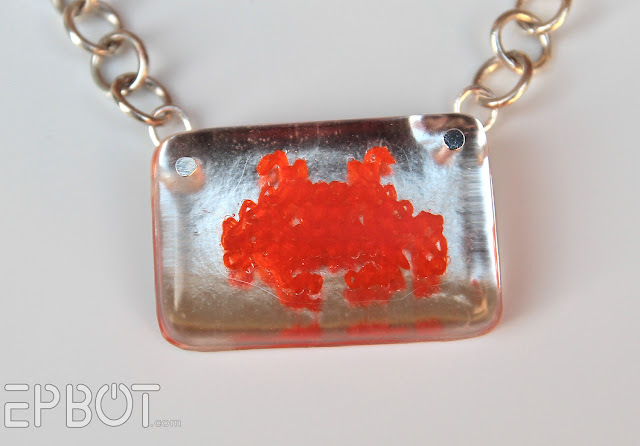 In the end both worked, really, but if you look reeeeally closely at the finished Invader necklace you can just see the edges of the plastic, so I'd say cutting it in the shape of your resin mold is the way to go. I liked the blue woven paper because it looks like fabric, but the combo with the orange looked a little sickly green. Plus the flowered paper was brighter. 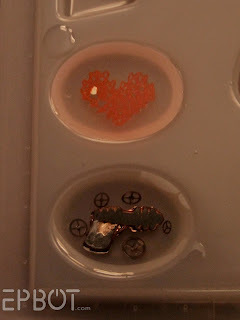 Oh, and as you can see this was done before I realized you can't embed sparkly little crystals in resin, because SCIENCE. [Insert refraction explanation here] So my heart now has a shiny circle on it. We'll, uh, call it a sequin. See the edges of the plastic sheet? It's just barely visible - and the resin bubbles, too - but keep in mind this pic is really zoomed in. Those imperfections aren't visible from even a foot away. Not gonna lie: I'm a lot prouder than I care to admit that I got both loops to match. There may have even been a victory dance involved. Maybe. Next I found a nice thick chain, and 'twas done! 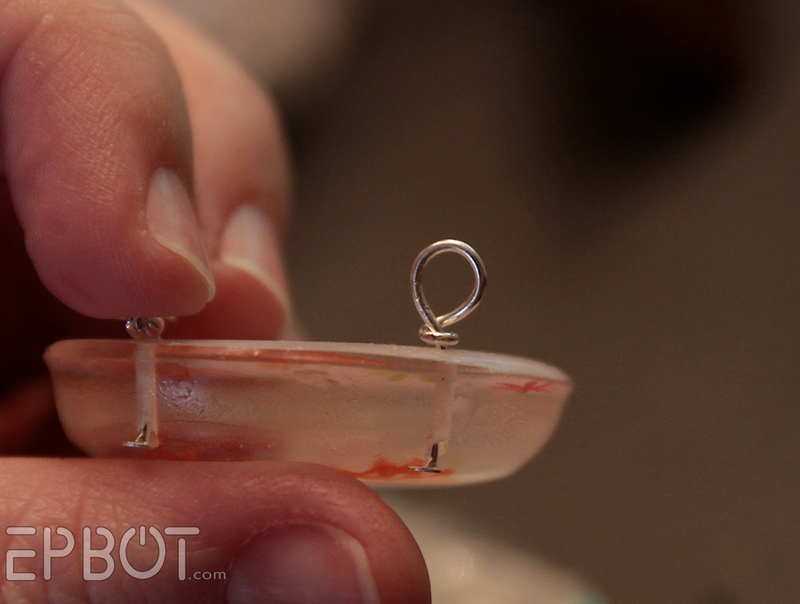 Another tip: when drilling the holes for your pendant, make sure you drill on a flat surface of the resin, so your pin heads sit flush. You can see mine stick out a bit on the edge. And that's my big resin experiment! 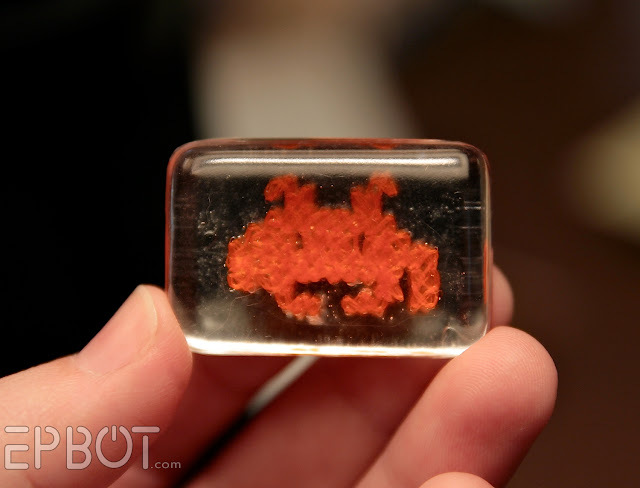 I hope this inspires lots of other cross stitch-and-resin projects out there, since to my knowledge no one has ever tried stitching on clear plastic this way before. I plan to do a few more myself, too, since these have their flaws. (Wouldn't it be cool to have a rainbow Invader, with each line of stitching a different color? Or a pretty monogram? Let me know what other ideas you guys have, since I'm still brainstorming!) As always, if you DO try, please send me pictures! UPDATE: See, this is why I love you readers: I've now learned of a wondrous thing called "waste canvas" that might solve my grid-placement issue! (I've been cross-stitching since I was 14 - how did I not know about this stuff??) Thanks, guys! I will definitely be giving it a try! Can you use waste canvas to help with your stitch placement? 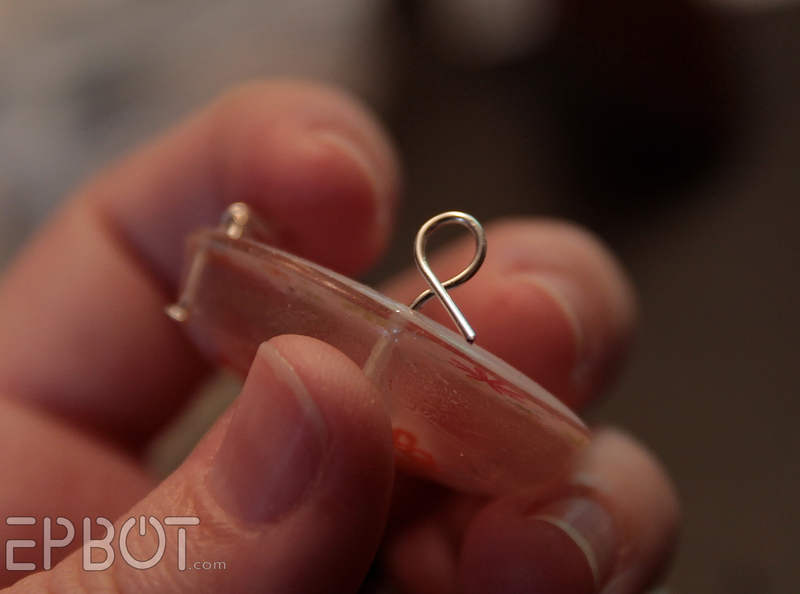 I used it years ago when cross stitching on sweatshirts, but I've never tried to stitch on plastic. OMG GOING TO TRY THIS! A tip for next time: why not use a pencil to trace the grid on the plastic? Can you use waste canvas to help with your stitch placement? I have used it on sweatshirts, but never tried to stitch on plastic. The pendants are adorable. 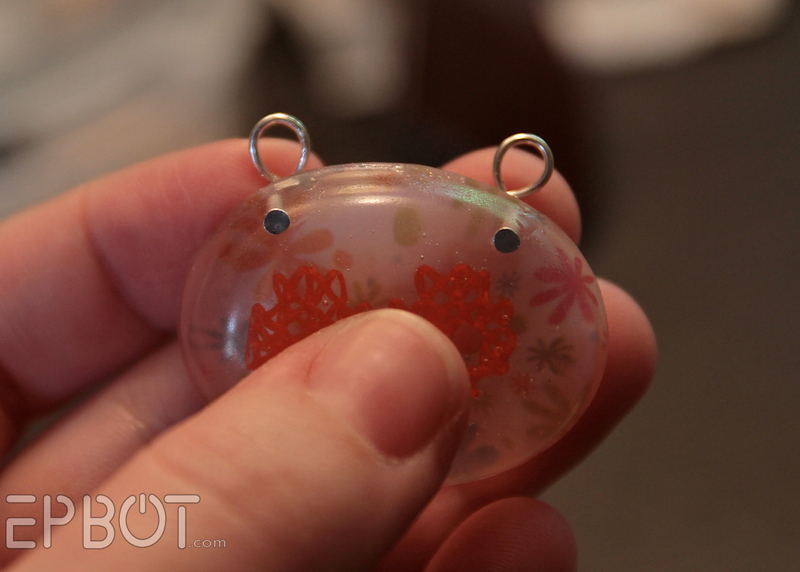 I'm going to have to play with resin someday. 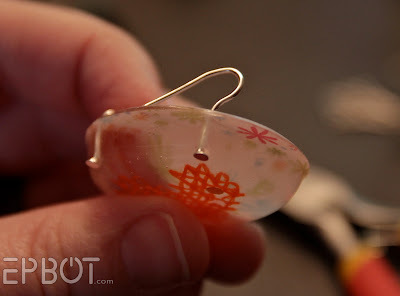 To know where to poke your holes in the plastic, you could tape it to a piece of embroidery cloth and then put that on, say, your ironing board and poke your holes with a needle. As an alternative (or adjunct) to tying little knots, you might be able to use a small dab of Fray Check, although it might show up in the final product or mess with the curing of the resin. Or you could do a double stitch at the beginning and end. Brilliant! 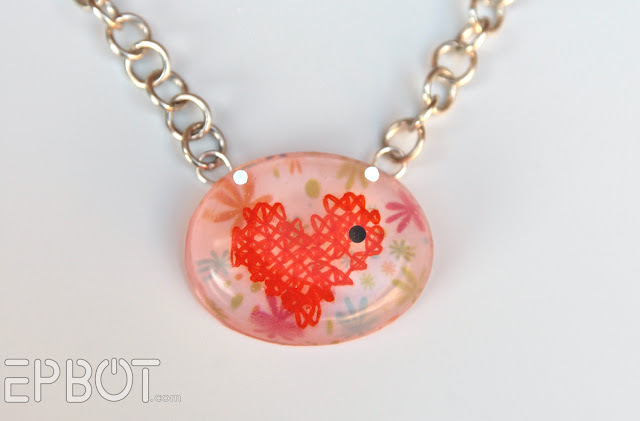 And I mean it...that's the cutest use of resin I've seen in a while. And I can't wait to try it. I had an idea while reading thru your trial and errors. 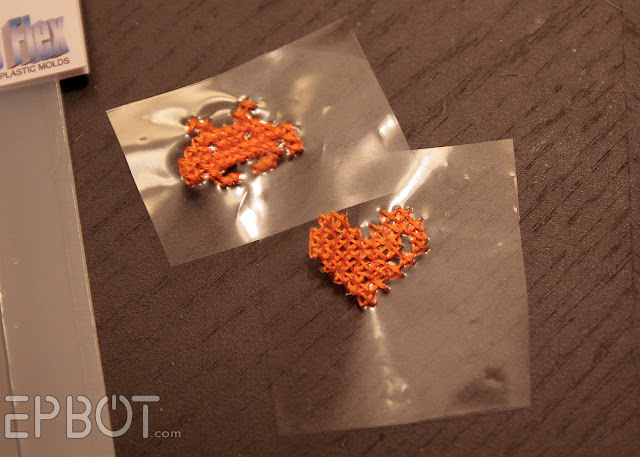 Try poking the holes in the plastic first so they'll be even and you don't have to guess. Maybe not even a full hole, but a small mark with the needle so you don't have to worry about stretching the plastic too much. I love cross stitch. Those pendants came out great! I also did a little victory dance when I saw the two even loops. I thought you must have used something as a guide! Great job! Oooo!! Now I must go play with resin! Great job! Using the 1 less strand really makes a difference, who knew? Could you print a pattern onto a transparent sheet and cut it out when you were done? You'd have to be careful with your stitching to make sure you covered up the pattern, and I know nothing about resin--could it possibly make printer ink run? For keeping your holes straight, you might experiment with taping waste canvas to your plastic sheet. Back in the 80s my mom got VERY into cross stitching -- she did motifs on all our Christmas stockings, on tiny sweatshirts for friends' babies, hand towels, you name it. The waste canvas gives you a grid to line up with, but when you are done stitching you can pull the canvas out from underneath, thread by thread. Yeah, it's a little tedious, but for a very small design it wouldn't take too long. You should be able to find it in any craft store with a needlework section. LOVE these. I've never done resin, but I've done a lot of cross-stitch. There's a product called perforated plastic -- it's like plastic canvas, but with a smaller gauge -- that it made of translucent clear material. You trim it one row outside of the stitching. I have no idea how it would look in resin -- the translucence might show -- but it might disappear. Otherwise, you could lay a sheet of it on top of the page protector and poke through it to get completely even holes. I'll send you a piece -- I have tons. For that matter, you could lay a piece of Aida cloth on the sheet protector and poke through to get even hole placement. Also, those cool, flattened fill-it-yourself ornaments you admired last year are in Michael's right now. Or if waste canvas doesn't work, perhaps dotting the stitch points out with a disappearing ink pen? Also found at craft/sewing store, for embroidery pattern transfers. To get your stitches even, why not lay your plastic over really small graph paper and pre poke your holes? you would probably want to draw your pattern onto the graph paper first to make it easier to only poke holes where you will be stitching. I would just use a light sheet of graph paper over or under the plastic, you should be able to tear it away easily when you're done. It's easier to get rid of than waste canvas, I use the technique in quilting all the time. Just a note, I recently found out about something called water soluble waste canvas, and it might be perfect for what you're doing. Something to look into maybe. If you use a loop start you will have one less knot and you could also just run your thread under a few of the last stitches put in to hold it into place and voila no knots at all. You are so very creative Jen! I love how your mind works. Someday when I get a dedicated craft room I will so try this out since I LOVE cross stitching. Another option to mark the plastic could be a permanent marker. After stitching use an alcohol of some sort(eg isopropanol) to soak in to get rid of the marker dots. 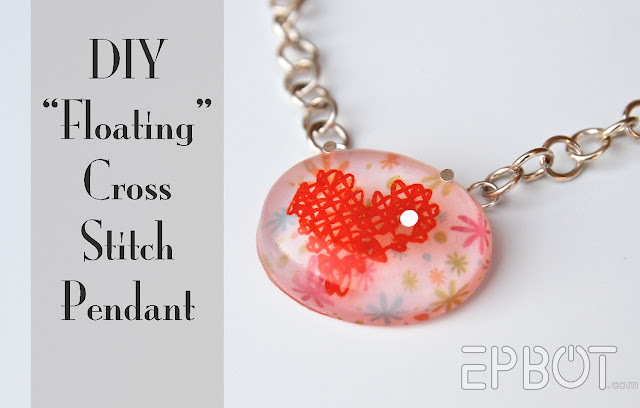 NOTE- if you do this then make sure your thread dyes will not wash away! Commercial dyes should be fine but hand-dyed stuff might not be. Hey, Jen! Either waste canvas would work, OR you could just lay your clear plastic over some graph paper and make light, tiny dots to serve as a guide. The dots would not show once you embroidered over them. If waste canvas doesn't work, I read a blog post on using Glad Press & Seal on fabrics--that way you can trace a design onto the Press & Seal, and then attach it to whatever you wish to cross-stitch or embroider onto. I am using it now to embroider something on Blackwatch plaid. In addition to the waste canvas try water soluable stabilizer. It's what you use to make lace on an embroidery machine. You stich your design then soak it in water and all that's left is the threads. You can find rolls of it in the machine embroidery section. 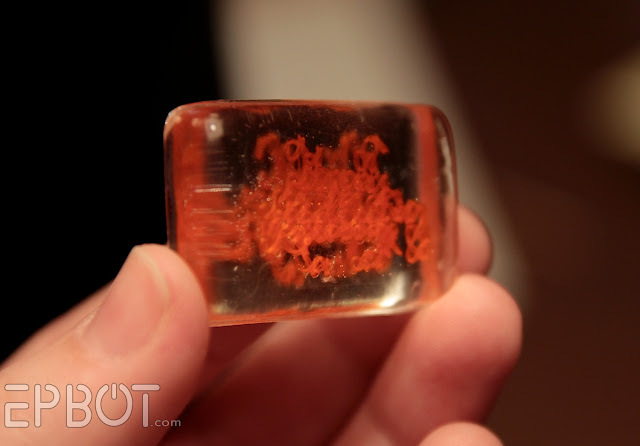 I wouldn't soak it before embedding it but it would probably dissolve in the resin. If you wanted to have just a design, you could stitch in black work. I've never done it, but I know it looks the same front & back. 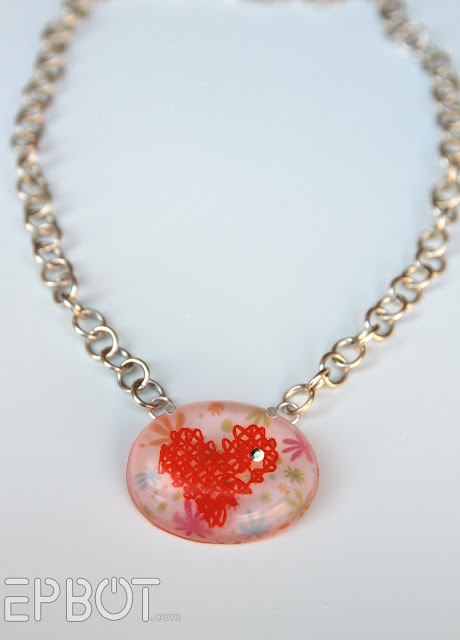 You could also copy your pattern directly on plastic sheets that are made to run through a copy machine. They make them for overhead projectors. Find them at any office supply store like Office Depot, Office Max or Staples. I was going to suggest waste canvas also, but Julie beat me to it! I used it to cross stitch designs onto my jean jacket & canvas sneakers (it was the early 90's). Great job on the pendants. You are so multi-talented! Now I have to look up Easy Cast Resin to see if I can build up the confidence to try it. 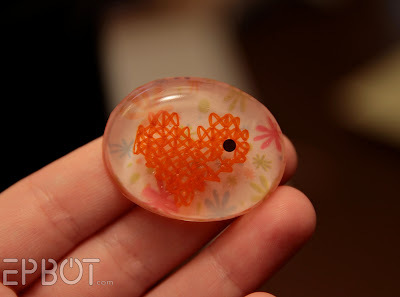 Saw something the other day with orange plastic goldfish set in resin, so cool! 2. as a jeweler i can tell you that perfectly matching loops is ALWAYS cause hor a happy dance. Oh..another reason why you may be seeing 'less' traffic on your sites is that AVG Anti-Virus added a Do Not Track feature to their tool bar. That's just an assumption I'm making. I love cross stitch. 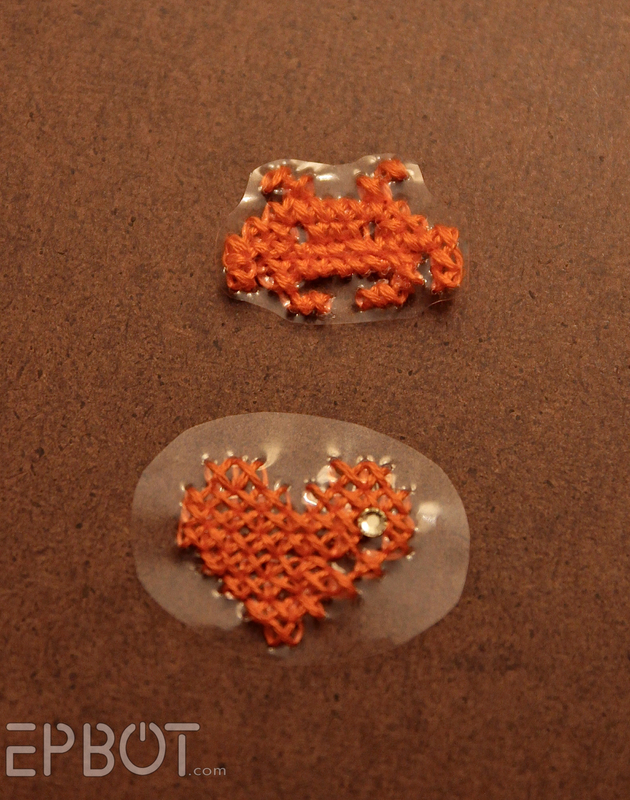 Maybe print or photocopy the cross stitch pattern onto your clear trasnparency. I would second the loop knot start- now I know how I almost never start with two separate threads- Just use one long thread, fold in half and put both ends through the needle- so like two threads at one end and a loop at the other, after the first half stitch, pull the needle through the loop left under the fabric- presto, firmly attached thread, no ends. I have been stitching up tea towels, and it ensures the thread is strongly attached too! This isn't a cross-stitch idea (although it could certainly be adopted) but I thought of a neat craft right as I fell asleep - shatter an ornament. Fill a clear glass ornament with resin and the pieces, OR fill another shatterable ornament with resin and the pieces then crack that second ornament away. Hopefully, if that all works, there would be an illusory hovering busted ornament left! 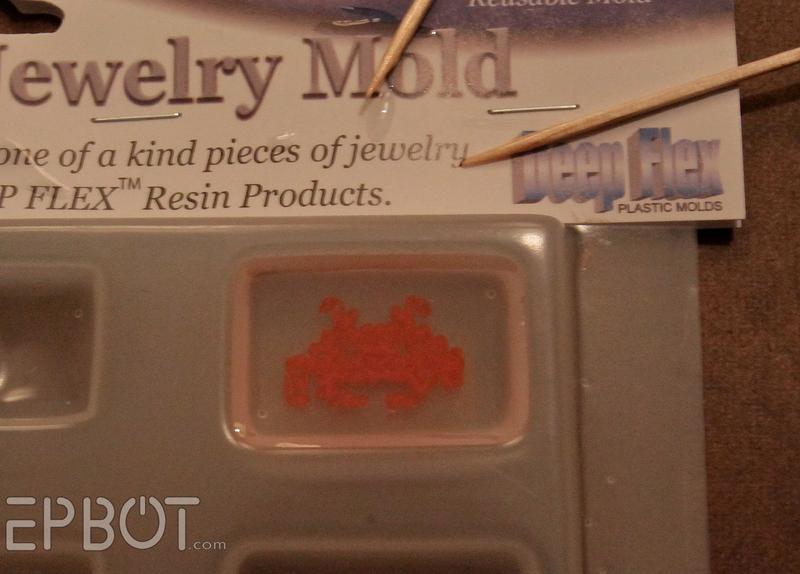 "I learned after the fact that using a sealant like modge podge can result in cloudiness in the resin since the resin can react with the modge podge. I did notice this a little bit, but I didn’t mind it since it went the “old” look I was going for. If that’s not the look you want, the folks over at Lisa Pavelka recommend packing tape or clear contact paper." "...because SCIENCE" is the funniest thing I've read online in forever. It cracked me up a couple days ago when I first read your post, and it's been cracking me up ever since. I finally had to let you know after I just chuckled all the way through my least favorite chore (cleaning the bathroom) with "because SCIENCE" in my head. Then I thought "because science" would be a great idea for a website. But, upon checking, found that lots of other people thought so, too. Don't know how I miss so many memes. Anyway, thanks for showing us your final product even though it wasn't "perfect." I love how you're willing to tell us (and show us) what went wrong so we can learn from your mistakes. 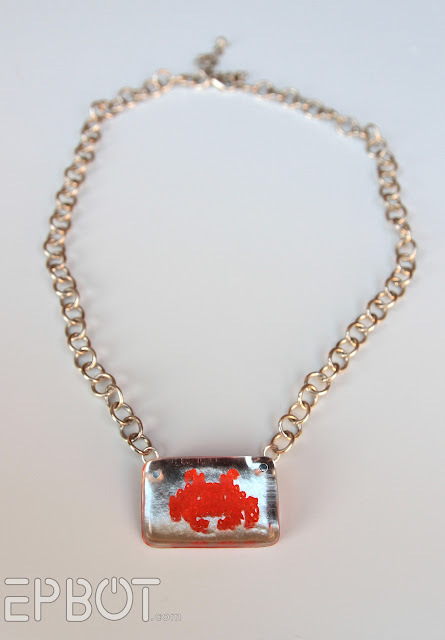 The pendants are awesome, and I'm sure they'll inspire lots of cool projects from your readers. I would say the perforated plastic would work but I think that you would see the edges in the resin. I think the waste canvas would work better. 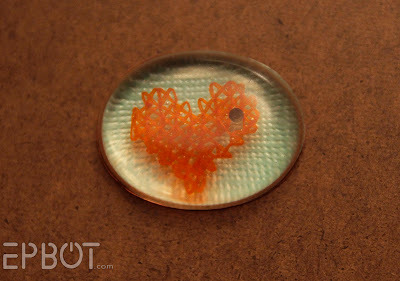 This is a must to show all my stitchy friends. I also think the waste canvas would work to even up the stitch placement. 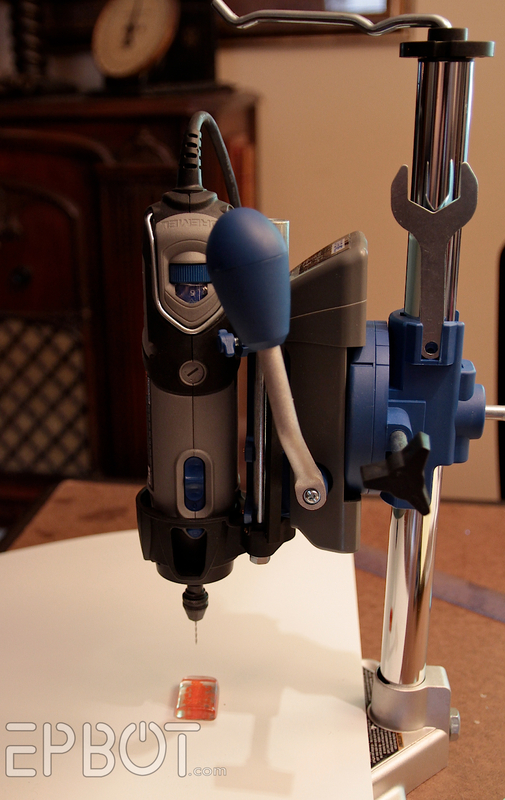 I think there are also some transparent machine embroidery stabalizers that would be more flexible than the plastic. That might or might not be a good thing. I really like the look of the floating cross stitch though. I've been wanting to try some resin and I think this is right up my alley! Thanks! There is also a soluble fabric you can buy. 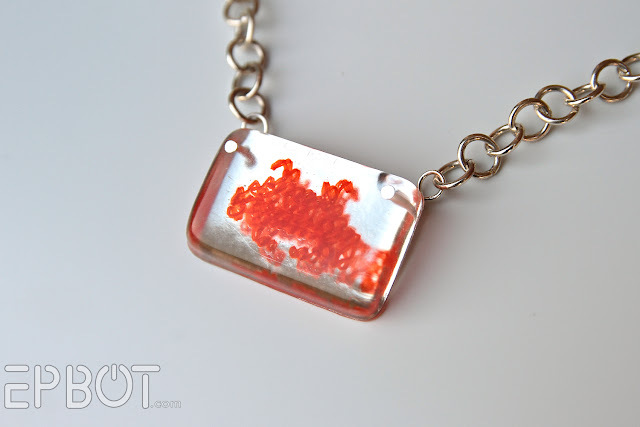 Stitch on this with the waste canvas and you can dissolve it away leaving just your cross stitch. I have been following Epbot and Cake Wrecks for quite a while now, and wanted to say that the Space Invader was so incredibly squee that it pulled me out of extreme shyness to comment. LOVE all the things you and John do, and I am going to get stitching soon! Pretty darned brilliant. I'm a stitcher with a resin kit that I've never used. I would have never thought of putting them together! Thanks for sharing. To get the holes evenly spaced in the plastic, you could lay a piece of plastic needlepoint canvas over the clear plastic, then poke thru the holes. I've used this technique before to evenly punch holes in cardstock. Works great!